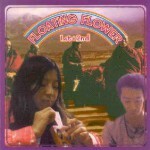 Floating Flower were a group formed Kawabata Makoto (Acid Mothers Temple) and married couple Kaneko Yuki and Tetsuya who specialize in Indian music. They released 2 limited CDrs of free raga folk in the late nineties that became hugely popular outside Japan and were frequently reissued. Now, reissued once more!